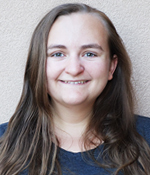 Lauren Zundel (BS Physics ’19) has been awarded the New Mexico Space Grant Undergraduate Research Scholarship. This award will help understand the optical response of arrays of nanostructures, with applications in solar energy harvesting and biosensing. Scholarships are competitively awarded based on application information including research project, its alignment to NASA, faculty letter of recommendation, and GPA. These awards fund students to work on research at the level of $5,000 for two academic semesters. Lauren has already published two research papers on this subject, and she has given several research talks. In October she received the "Best Undergraduate Research Talk" award at the 2017 Four Corners Meeting of the American Physical Society, held in Fort Collins, CO.
Assistant Professor Alejandro Manjavacas is her faculty and research advisor. See the main UNM Newsroom article and the combined Newsroom article. Congratulations, Lauren!